Ha, see what I did there? 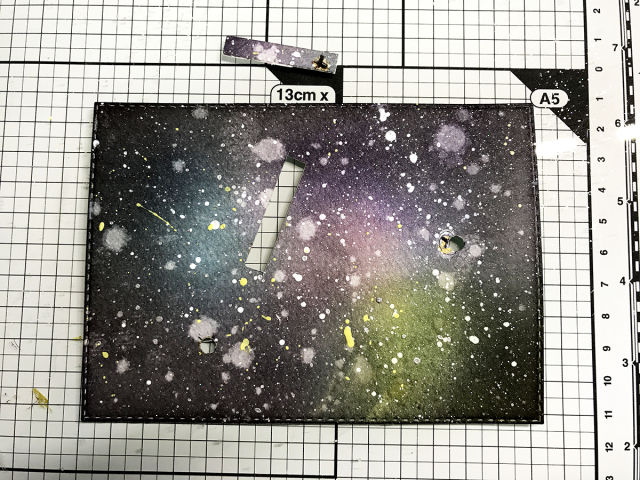 I made a space card! Feel free to groan, I know my husband will ;) Anyways. 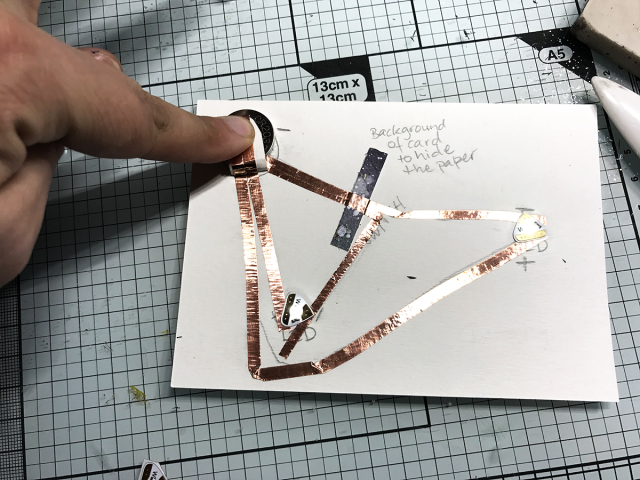 Chibitronics team up with the amazing Lawn Fawn to make some fun light up projects. Today is day three and there's a lot of fun projects to check out, I'll link to each of the posts on Chibitronics and Lawn Fawn blogs for you to check out. AND theres a surprise for you too. There is a $30 Lawn Fawn gift card and a Chibitronics starter kit (valued at $30) that will be given away randomly to two winners drawn from comments across all days and all blogs so the more you visit and comment, the better your chances to win! All Lawn Fawn stamps are so much fun to use with the lights, I had so many ideas but I went with this space card in the end. It works like a slider card, when the little astronaut is moved down it lights up the sun and the planet holding the flag. I did some trial and error to come up with a switch that would work for this idea but luckily enough you won't have to, because I'm going to show you just how I did it. 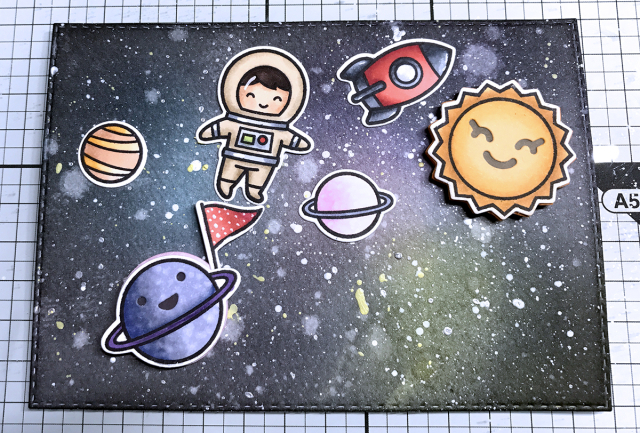 First step was to color all the cute images up and make a galaxy background. 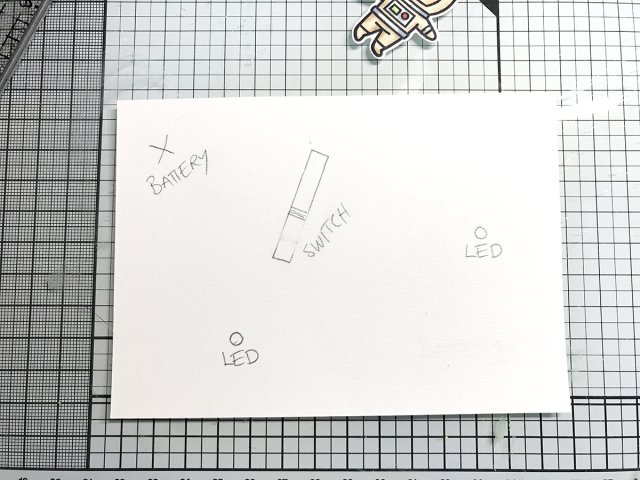 I rarely plan my cards in advance but I've learned that when playing with Chibitronics it's always best to start with a plan. That way you don't waste any LEDs or copper tape when making your circuit. I placed my images where I wanted them and left some space for a sentiment in the lower right corner. I marked the placements of the LEDs and the track the astronaut would move up and down and made holes for the lights to shine through. I also made sure to save the rectangular piece from the track. It will later hide the white background behind the astronaut when she is in the lower parts of the track. I cut a background piece to the same size as the cardfront and marked where the holes for the leds was and where the switch was. 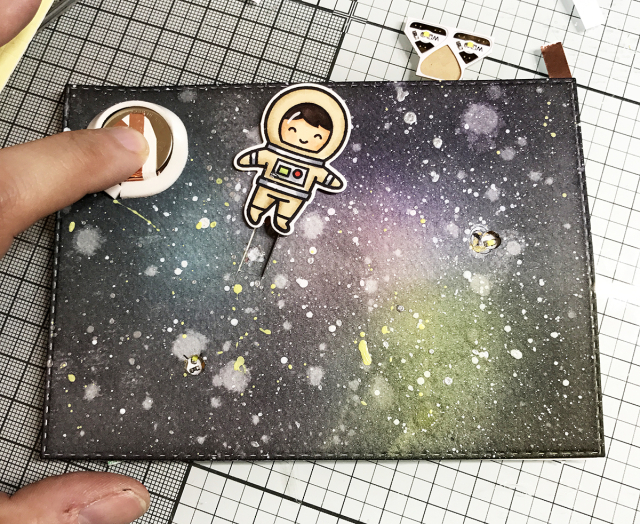 I also made somewhere for the battery to live, I had to color and cut out another planet for hiding the battery behind. Then I planned my circuits. 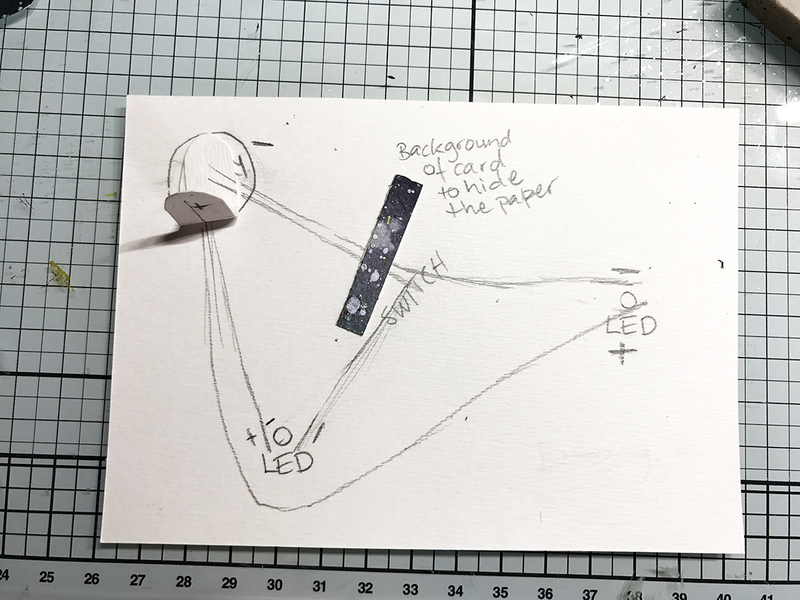 I had to make two separate circuits, one for each LED, making sure the copper tape would not cross each other. I also attached the background for the tracks and made a flap to hold the battery and to allow the copper tape to reach the other side of the battery. After all this was done I cut the circuit on the track for the astronaut. What! After all that work? Don't worry. I figured out how to make a switch out of a coin and some thin foam adhesive. I made a track big enough for a coin to fit where the track for the astronaut was. On the backside of the coin I first placed some thin double sided foam pads and then covered them with copper tape (sorry, I forgot to take a picture). 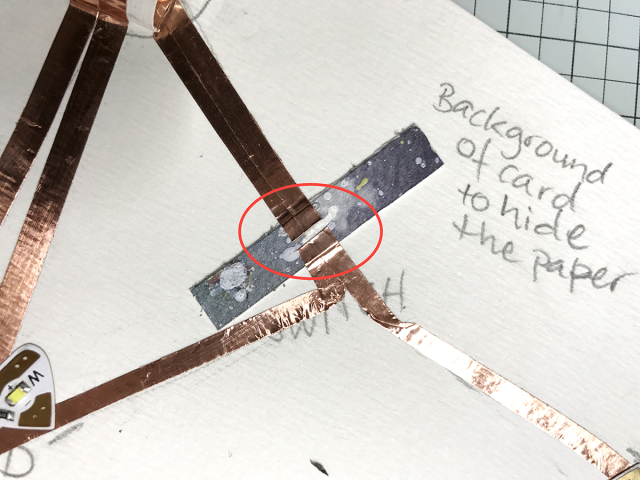 I noticed that the coin was to flat and hard to make a good connection but adding some foam made it press down to the copper tape on the card better and that made it work much better. The copper tape on the coin will now close the circuits again when in the lowest position, and when slided up it will break the circuit and make the lights go off. I made a hole for the battery to have more room and building it in with a thin strip of foam tape. I also used a thin strip of foam tape to attach the astronaut to the coin on top of the card front. Now you are able to slide it up and down making the lights go on and off. 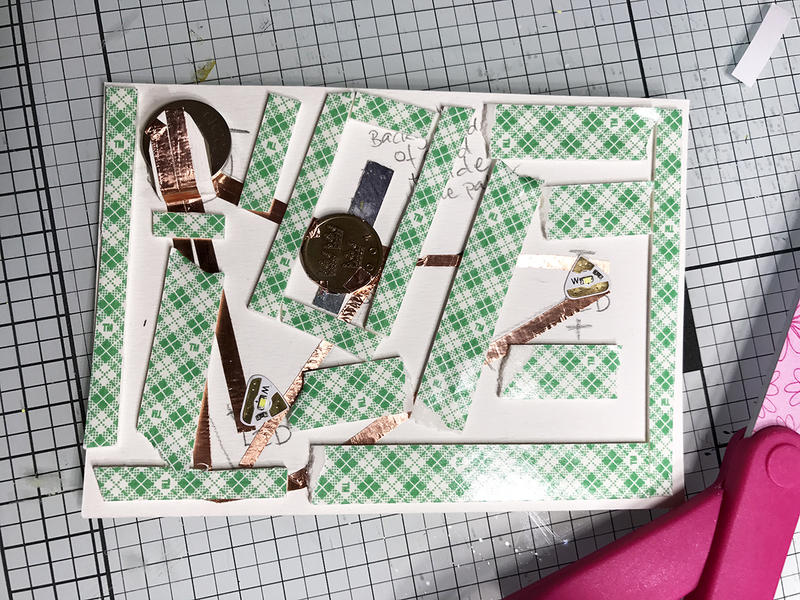 After that I just glued al the elements down again and attached it to a folded notecard in the same size. I added some glitter stars around the card to make it sparkle some more. I hope you like my project and got inspired to try something similar. Here are the links to Chibitronic and Lawn Fawn blogs, do check them out. There's so much inspiration there, and don't forget to comment for a chance to win! I used the stamps and dies from Lawn Fawns Out of This World sets, together with the smily face dies in the die set Make Me Smile. Supplies from Chibitronics were the regular white LED lights and copper tape. Oh, this is sooo cute! Very clever how you did this. Thanks for showing how you did it! It's amazing how simple it is to light up the sky and how much it adds to a card. Your little astronaut is adorable. This is totally incredible!! Thanks for doing all of the hard work and sharing with us this wonderful tutorial!! So cute on its own, but with the lights... bam!! Wow! Great collaboration!!! I’m in love for your adorable card!!! Too cute!!! Such a fun card! 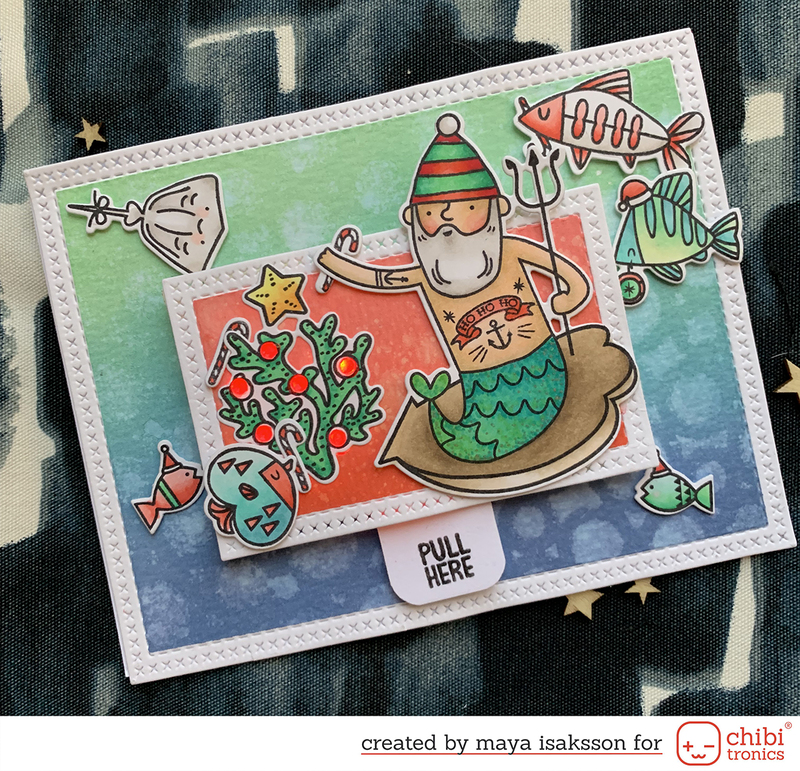 Love the stamps you used and the addition of the lights to make the card extra special! Very clever interactive light up space scene! thanks for sharing your hard work with us. Such a fun card. Very creative. Such a cool card design! I love the light-up element! 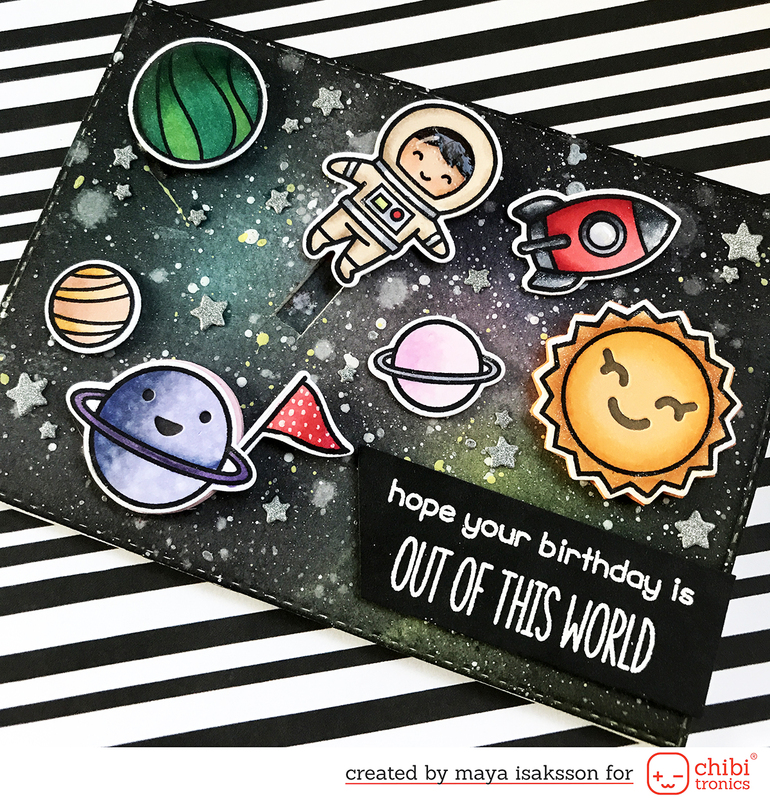 Your card is just amazing! I really love the background. Fantastic! Awesome! Love the lights. Thanks for showing how easy it can be used. Wow!, you are very clever with your sliding switch. Your card is awesome! So clever! Thanks for sharing your tips for the slider switch. Can't wait to make one!! I love your card design and the way the astronaut triggers the lights. Also, I noticed that you colored the space suit in earth tones - I've only seen it done in greys before; I like the earth tones - something different. 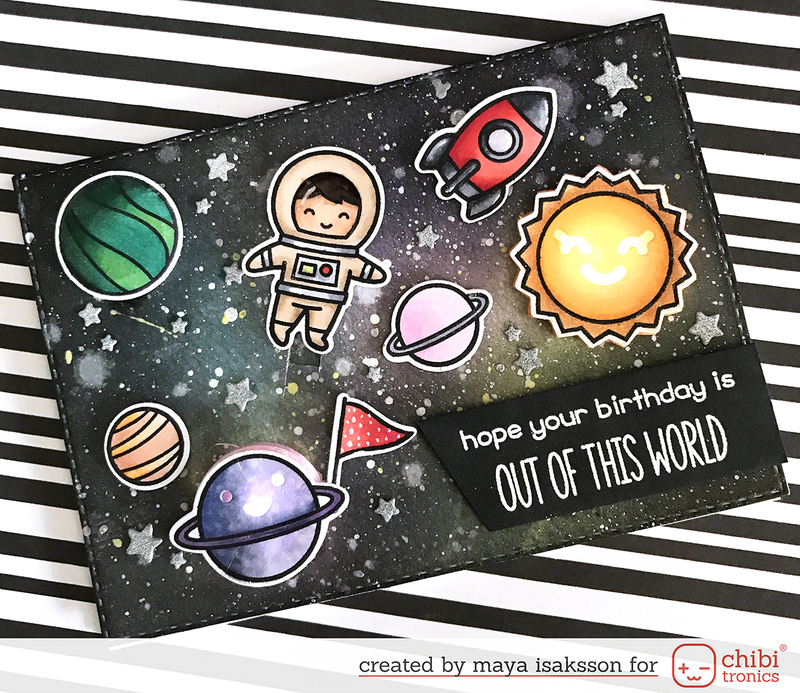 Very clever card!I like that you have used the astronaut as a switch! That is so much fun! Thanks for the detailed instructions! What a darling card with a beautiful sky background. Wonderful card! I really like how you made the switch for the lights to turn on and off. Brilliant! Beautiful! Thanks for the details on the back. Super helpful! Thanks for the great detailed how to's! This card is adorable! WOW! This card is simply amazing. Your galaxy background, your coloring and then the lights?!?!? Wow! Oh Wow! it looks like there were a lot of steps involved in making this card. You did a great job and it looks stellar! thanks for the step by step, so cute! Wow! Amazing card!! I love that the switch is the sliding astronaut. That is so clever!!! Great card! Thanks for teaching us about the switch... I've wanted to do that on my cards! Wow, what a creative & clever card. I love that you gave the light-up planet a little flag to wave - so cute! I love this imaginative and interactive card. Wonderful, clever use of the face on the sun!